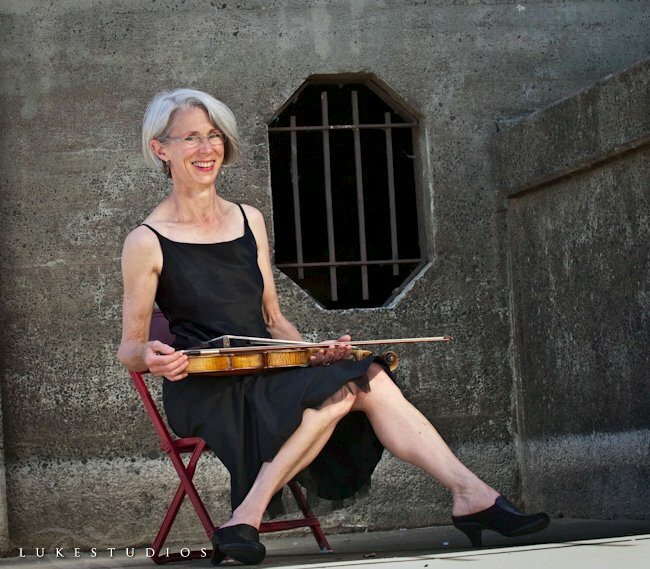 Joanna Shelton is an Eastman educated freelancer whose playing and teaching have involved her with Minnesota Opera, Minnesota Orchestra, St. Olaf College, College of St. Benedict, MacPhail Center for Music, Children’s Theatre, Guthrie Theatre, and even the Shrine Circus! For her, teaching violin is fostering the DIY movement, “making your own music just has to earn WAY more cosmic points than listening to someone else’s expert studio work.” Her yard is a lawnless cacophony of perennials fighting it out among themselves–Joanna is merely the editor…her kids grew up pretty much the same way. She also knits fraternal twin socks (with the help of her cat and dog). A favorite professional experience is having string quartetted for Theatre de la Jeune Lune’s creative reincarnations of Mozart operas (between ’99 and ’07)…another is the ongoing exploration of famous and little known music on period violin with Lyra Baroque Orchestra.